Magic Johnson joined Larry Bird as the two marquis players of the 1980s. They were forever linked after Magic's Spartans defeated Bird's Indiana State team to win the NCAA title in 1979. Magic was later named tournament MVP. Magic was the Number One pick in the draft in 1979 out of Michigan State, leaving as his school's all-time assists leader. Lakers' owner Jack Kent Cooke signed Magic to a 5 year deal worth 500,000 a year, the highest salary of a rookie to date...Bird later signed for $600,000 a year. He had an immediate impact on the league, but Larry Bird won rookie of the year honors. 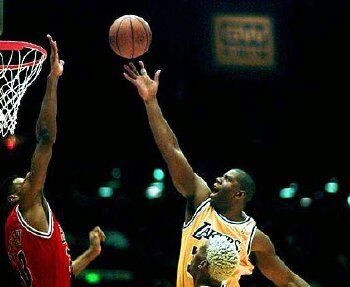 Magic led his Lakers to 5 NBA Championships in 1980, 1982, 1985 and back to back World Championships in 1987 and 1988. He was the Finals MVP in 1980, when he played every position for the team, and again in 1987. Even when he wasn't winning championships he was playing in the big games. Magic's Lakers finished as runnerups in 1983, 1984, 1989 and 1991. As you can see, Magic's team only sat out of the NBA Finals in 1981, 1986 and 1990. 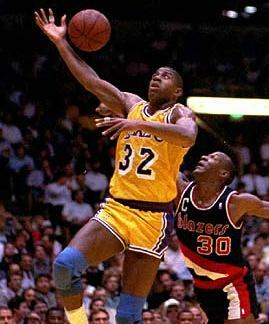 Magic Johnson has individual honors as well, being a three time league MVP in 1987, 1989 and 1990. He is also a twelve time NBA all-star including the in 1990 and 1992 when he was named MVP of the game. He added an Olympic Gold Medal with the Dream Team to his other Championship titles in college and the NBA. On April 15, 1991 Magic surpassed Oscar Robertson's assist record of 9,887. This record has since been broken by John Stockton, but Magic remains firmly entrenched at number two on the all-time list, being only the second player to reach 10,000. He stunned the world during the 1991-1992 season with his announcement of his retirement before the season began, due to testing positive to the HIV Virus. He made an appearance at the All-Star Game that year, winning the MVP honors with his 12th appearance and tenth start. He also made a failed comeback attempt and took over the Lakers as coach. In 1996 he made his return, looking like his old self again and leading the Lakers into the playoffs. Unfortunately, he retired again at the end of the year. 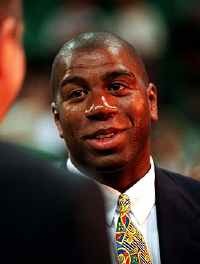 Magic was named to the All-NBA Interview team in 1996 due in large part to the media hype associated with his return. 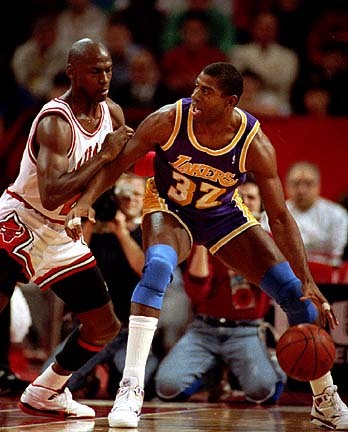 As a last honor, before the Hall of Fame, Magic Johnson was named one of the 50 Greatest NBA Players of all time. In his retirement, Magic spends time with his wife Cookie and his son Earvin III. He also organized a team of ex-NBA stars and has been touring the Globe...another Harlem Globetrotters team I suppose.